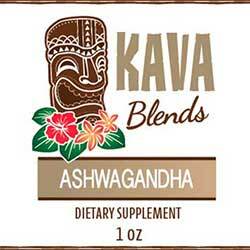 Kava can help promote feelings of well being and calmness. But what if you want to kick your Kava up a notch, and accentuate it with something equally as famous for balancing a system and providing a sense of well being and balance? This is where Ashwagandha comes in. Many herbal blends combine only a few milligrams of each herbal ingredient in their formulations, making it nearly impossible to feel the effects of any of them. Herbs need to be concentrated, and that is exactly what Happy Kava Brand has accomplished with this Ashwagandha Tincture Blend. We add the equivalent of one-half teaspoon of Ashwagandha root into every serving of this tincture (4 dropperfuls is a single dose). We don’t add any other filler herbs that may or may not actually have the energizing and balancing properties that Ashwagandha has. All we have in this award winning Ashwagandha Kava Tincture Blend tincture is pure Noble Kava root with a 2-4-6 or 4-2-6 Kavalactone lineup, and pure Ashwagandha root. Directions: 4 dropperfuls no more than 2 times per day. Do not exceed 4 dropperfuls per serving. Daily dosage not to exceed 8 dropperfuls. Maximum period of daily use: 3 months. Use may resume for 3 months after a 2-week break.